aware that his status follows from awful nutritional habits and wrong lifestyle. No bike can be spotted along the way while huge SUV fill the roads and get stuck at any intersection as much here as anywhere else in Venezuelan towns. Accordingly air pollution is high where humans live although this beautiful and diverse country is (luckily) altogether still scarcely populated. However birth rate is high and worrying in the long term. I bet the obeses number is somehow proportional to the number of vehicles around and the populist government policy favors such social tragedy: here you can buy 100 litres gasoline for 7 Bolivar which is currently 1€ at nationwide common black market. This is certainly one of the cheapest gasoline prices worldwide, the cheapest as far as I know. As a result 2.5 tons heavy cars are used to carry humans (whose average weight should be about 70 kg) even over a few hundred meters distances. And the fact that Venezuela is a big oil producer does not justify at all that ridiculous output. Extraction cost of one liter oil is by itself higher than one liter gasoline at the pump, an highly subsidized political decision to draw mass consensus. As very poorly educated masses welcome the almost for free fuel, Venezuela burns about 750.000 oil barrels per day, a relevant figure for a country with 27 millions people and about 350 billion US$ Gross Domestic Product (GDP). It follows that its energy consumption per GDP is by far the largest in South America and one of the largest in the world: more than twice as much as Chile, nearly three times as much as Brazil, more than three times as much as Italy. the major urban areas. A demagogic, catastrophic choice which pushes the citizens to consume with no limits and no environmental awareness. While socialism is the ideological flag of the Chavismo, it seems to me there is in fact nothing truly socialist in the Venezuelan government action which is rather wasting the national resources, scaring international investors and leading to an overall impoverishment of the country. 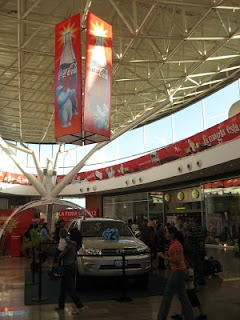 Meanwhile in the relatively rich town of Puerto Ordaz (the very one with some decent urban planning and pleasant parks) the socialist country masses enjoy the seducing atmosphere of the enormous shopping mall Orinokia with shining SUV and Coca-Cola on display.